Hey, where'd October go? Work started picking up in September and now suddenly it's November. I feel like I missed my favorite month of the year. But it was not without a little hobby progress. 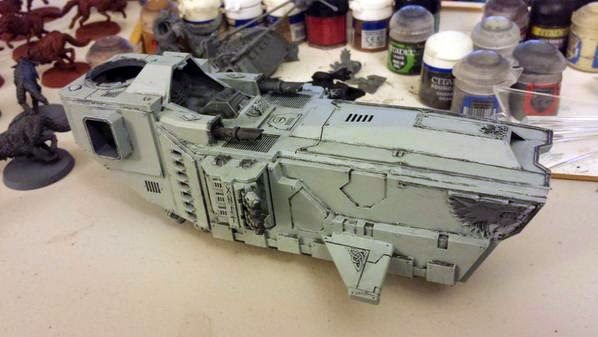 I've been working on a Stormwolf and a Logan Grimnar on Stormrider for a commission. Putting Logan together proved to be a little more interesting than I expected. You can take him on foot or mounted, and since they stopped selling him on foot, I expected he would fit into his chariot while mounted on a 40mm base. So after some drilling and clever magnetizing later, I had a magnet in Logan's foot, one on the underside of the chariot floor, and one in the 40mm base. Not ideal, perhaps, but it gets the job done. Personally, I'm thrilled that I have one of the old Logans they used to sell so I don't have to play this game when I buy my own Logan on pimp chariot. I also participated in a Victorian Horror themed dungeon crawl on Halloween. 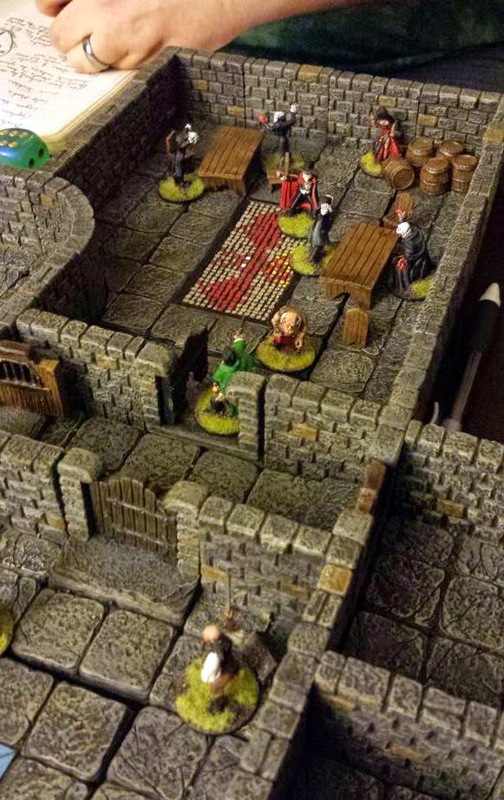 We used that fabulous Dwarven Forge dungeon terrain for it. Somehow, we ended up with two traitors, and so after some initial niceties in the first few rooms, it quickly descended into a homicidal massacre. I might or might not have been the catalyst in that misadventure. Despite having accidentally ended the game before we got through the whole dungeon, it was a very fun time. I'm looking forward to doing more games like this in the future. There are 6 weeks left in my semester, and then I am d. o. n. e. DONE! Which means a lot more hobbying will be happening thereafter. Maybe even some Termies for my Space Wolves. I have a few dozen Wolves to finish before I start on any other projects. It is only slightly smaller than my dog's head. If it wasn't for someone else, I'd be tempted to paint eyes, a nose, and a mouth on it.